Dedicated to the problem of underbreathing, a.k.a. hypopnea. Here causes, syptoms, consequences, risk factors and ways of treatment of hypopnea are covered. Hypopnea can be characterized by recurrent episodes of upper airway obstruction during sleep. They are commonly associated with the so called recurrent oxyhemoglobin desaturation and frequent arousals from sleep. The term obstructive sleep apnea-hypopnea syndrome (OSAHS) is frequently used when such episodes are associated with excessive daytime sleepiness. The majority of patients with obstructive sleep apnea-hypopnea syndrome demonstrate upper airway obstruction, either at the level of the soft palate or at the level of the tongue. Anatomic factors include enlarged tonsils, macroglossia, or abnormal positioning of the maxilla and mandible. They decrease the cross-sectional area of the upper airway and increase the pressure surrounding the airway, both of which predispose the airway to collapse. Upper airway neuromuscular activity decreases with sleep, that is more pronounced in patients with sleep apnea or hypopnea. Reduced ventilatory motor output to upper airway muscles is believed to be the critical initiating event leading to upper airway obstruction. Central breathing instability has been well established as a contributor to the development of central sleep apnea, particularly in patients with severe congestive heart failure. There’s a good ground to believe that central breathing instability also contributes to the development of obstructive sleep apnea-hypopnea syndrome. First of all, there is upper airway obstruction in the absence of ventilatory motor output. Second of all, reduction in pharyngeal dilator activity is associated with periodic breathing and hypocapnia in subjects with evidence of inspiratory flow limitation. Third of all, there is the evidence of increased prevalence of OSAHS in men, as they are more susceptible to the development of hypopnea and central sleep apnea and have a more decreased responsiveness to carbon dioxide than woman. We have determined that hypopnea is an abnormal type of breathing when the airflow is labored because of some pathology of the respiratory system. Generally speaking, breathing turns out to be quite a complicated issue. And apart from hypopnea there rather a large number of other breathing patterns. Let’s have a look at some terms and their short definitions. Speaking about hypopnea in these terms it can be defined as the reduced amplitude of breathing at the normal rate. When breathing is normal the breath airflow is 100% to 70%. Hypopnea is a decrease in breathing when hypopnea-airflow is 69% to 26% of a normal breath. There is the hypopnea index (HI) that can be calculated by dividing the number of hypopneas by the number of hours of sleep. But as far as hypopnea is closely related to apnea (total cessation of breathing) the apnea-hypopnea index (AHI) is commonly used to describe breathing disorders during sleep. AHI is an index of severity that combines apneas and hypopneas. AHI is calculated by dividing the number of apneas and hypopneas by the number of hours of sleep correspondingly. When the apnea-hypopnea index is positive we generally speak of sleep-disordered breathing (SDB). SBD is a prevalent condition in the US general population that commonly associated with overweight and obesity. Most often problems with weight are caused by metabolism infringements and some eating disorders such as binge eating disorder. Sleep-disordered breathing and all related diseases (sleep apnea, hypopnea, obesity hyperventilation syndrome, etc.) usually improve when the eating disorders causing overweight and obesity are properly treated. So there is a straight relation between weight loss and improvement in sleep-disordered breathing. 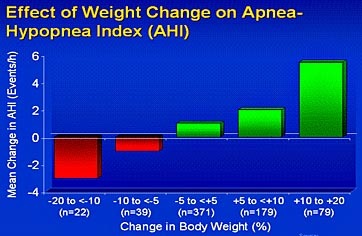 The figure shows the relationship between weight change and the apnea-hypopnea index. The data demonstrates that changes in AHI are related in a dose-response fashion to changes in body weight. A 10% weight loss is associated with a 26% decrease in the AHI, whereas a 10% weight gain is associated with a 32% increase in the AHI. So there are improvements in sleep-disordered breathing (sleep apnea and hypopnea) in case of weight loss and worsening of the disease in case of weight gain. You can read more about the subject in Longitudinal study of moderate weight change and sleep-disordered breathing by Peppard PE and others. The most common and effective treatment of hypopnea is continuous positive airway pressure or CPAP. A patient puts up a mask over his face (nose or mouth) and an air blower forces air through the upper airway. The air pressure is adjusted in a way to avoid the upper airway tissues from collapsing during sleep. Also mild hypopnea can be treated by losing weight, refusing from alcohol and smoking before sleep, doing certain excercises that strengthen gullet muscles, avoiding sleeping on your back and some more. Hypopnea comes from the Greek roots hypo- (meaning low, under, beneath, down, below normal) and pnoe (meaning breathing). Literally it means underbreathing. In case of hypopnea breathing is shallower or slower than normal. It is a sleep disorder that can be characterized by person’s repetitive stops of breathing or low breathing for short periods of time during sleep. Hypopnea is distinct from apnea in which there is a total cessation of breathing. Hypopnea may disturb a person’s quantity and quality of sleep as it often causes a severe sleep breakup. It all results in sleep deprivation and excessive daytime sleepiness, most usual consequences of which are traffic accidents, diminished productivity, emotional problems, etc. Cardiovascular consequences of hypopnea include myocardial infarction, stroke, psychiatric problems, impotence, cognitive disfunction, hypertension, coronary heart disease, and memory loss. Not everyone who suffers from hypopnea has all these symptoms and not everyone who has these symptoms suffer from hypopnea.